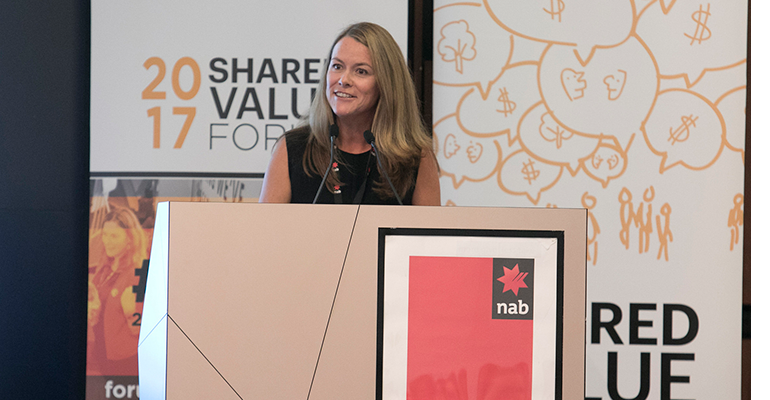 Helen Steel is the CEO of Shared Value Project, and has been instrumental in driving the concept of shared value in Australia. She is this week’s Changemaker. Shared Value Project CEO Helen Steel. Steel has more than 20 years’ experience in leadership roles across the government, corporate and not-for-profit sectors. She has been the inaugural executive director (now called CEO) of SVP since 2014, responsible for SVP’s overall strategic direction and management. Steel has helped SVP to become the peak practice body for shared value in Australasia, with members including NAB, Nestlé Australia, World Vision and The Australian Department of Foreign Affairs and Trade (DFAT). In this week’s Changemaker, Steel explains how she helped launch SVP, details the varied nature of her role and states her vision for shared value in the future. What is your history in the government, corporate and not-for-profit sectors before arriving at SVP? I began my career in the private sector working actually in IT, [which is] my original background. And then I moved to the US and was there for 14 years. I guess it was when I was in the US that I was introduced to the not-for-profit sector, and I worked with the United Nations Association and also with the American Australian Association. That was my foray into the not-for-profit sector and then coming back to Australia I worked with local government. It’s interesting, even though we’re a not-for-profit organisation, we work with all the sectors: corporate, government and not for profits. So I kind of feel that my background – call me a crossdresser if you will – is well suited to the new role in supporting all of those different sectors and having the ability to speak all three languages, or all four languages depending on how you look at it. So what attracted you to work at SVP? My colleague working with me at the City of Melbourne at the time actually showed me the original article [on shared value]. This was back in 2011, and I guess the experience that I’d had in the corporate social responsibility world in the US was vastly different to the experience that I was seeing happening here in Australia. And when I read the original article I thought, well actually maybe this is an opportunity for Australia. Maybe this makes much more sense from a business perspective and perhaps this will be a concept that Australian businesses can grasp. And so I just thought it was a really good idea and we began informal dialogue with a number of companies including BHP and NAB and PwC, AIA, and just started to have some round table discussions about this concept of shared value and what the opportunities might be. And we began those round tables in 2012 and then the momentum for the idea seemed to be growing. So in 2014 we formalised the organisation and became a company limited by guarantee but running on a not-for-profit model and as a membership organisation, and it’s just kind of grown from there. I guess the Porter-Kramer concept of harnessing capitalism to help solve social issues is what really attracted me to the idea and that’s sort of what really drives me. It’s amazing for us to look at our cohort of members and those companies that are involved and just see the genuine intention from them in really trying to embrace this concept. So how do you now see the state of shared value in Australia compared to other developed countries? Yeah that’s a really interesting question because when Porter and Kramer wrote this article they weren’t thinking about developed countries. They were very much thinking about emerging markets. [But] it has resonated well in Australia and it is not a coincidence I think that the Googles and the Apples of the world often use Australia as a test case, because we are a relatively small market but obviously a wealthy nation and so when concepts resonate here, they seem to sort of be adapted quite quickly. Having said that, although there’s a lot of companies now considering the concept of shared value in terms of the real outputs or real results, that’s still in progress. But we’ve certainly seen over the last four years this concept resonating incredibly well. And I think if you marry that with what’s happening in the world and you consider the Edelman’s Trust Barometer which came out recently, and even recognising that whilst institutional trust might be at an all-time low, there is a real recognised opportunity for corporate CEOs to play a real leadership role in going forward and engaging the community much better and helping companies to consider what their obligations are in regards to society . And so if you marry that thinking with the emergence of shared value and in companies that have very strong purpose and are being very strongly purpose-led, this is a time of transformation for the corporate sector and we’re certainly seeing that playing out on the shared value stage with more companies contacting us who are interested and from different sectors as well. Initially there was a lot of interest in the financial services sector – not surprising given that it’s a very competitive market here and shared value at the end of the day of course is about competitive advantage. But now the energy sector, the health sector, property development [all see] there’s so many other opportunities and that’s what we’re starting to see in terms of the companies that are contacting us. What do you see as the scope for shared value to develop in future? Well we obviously want this to become business as usual. So when companies are developing new products or services or considering their supply chain and every aspect of their business, they should also be considering the social side of the engagement. I think we’re a little way from achieving that objective but that’s ultimately what we’re working towards. And interestingly I guess as an organisation, our objective is to become obsolete, because you won’t need an organisation like SVP to be promoting the concept and helping educate around the concept because businesses will be just doing it. 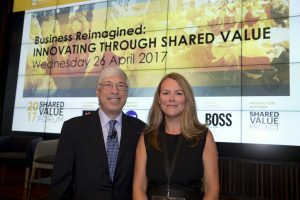 Helen Steel with global shared value expert Mark Kramer. How does a typical day look for you as CEO? I think that any not-for-profit CEO would share my story in that it’s very varied. I mean one moment you’re the head of HR and the next moment you’re the head of your legal team. So it’s very varied and I guess what I’ve really enjoyed about this role actually is certainly really learning how to build on lots of different skills in all of those different aspects of the business. And I guess ultimately my focus is on the business development and managing the partnerships and supporting partnerships and out there speaking about the concept as well and promoting that. But as the head of every small not-for-profit organisation knows, you wear so many hats in this role and you go from having lunch with the prime minister one day and then making tea and coffee for everyone the next. But that makes it really interesting and exciting as well. How has the government supported you in promoting shared value and what role can governments play in its development in Australia? We’ve been very fortunate that DFAT has really embraced the concept and are using shared value as a framework to consider different aspects of our international aid program. And because of that leadership role that they’ve played there’s a number of government departments now that are considering what the opportunity might be for them, including the Department of Environment and Energy and the Department of Social Services and others. Shared value is a really great framework that government can use to help get better private sector engagement and not only private sector engagement, but bringing the not-for-profit sector in to develop real partnerships that actually help solve some of those issues. It’s not government’s role to solve the issue, but it’s government’s role to facilitate and be that broker. Government understands the issues really well and is in a unique position to really broker some of those outcomes rather than always providing funding. There’s such an expectation in Australia about governments solving all of our problems and providing funding to solve those problems. 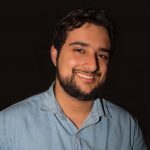 But I think government can be much smarter in how it conducts its business and really bring in the private sector to ultimately fund a lot of potential solutions to many of the issues we face, whether it’s international aid or in the healthcare sector or whatever the issues are we are facing. And I guess the fact that shared value has resonated in Australia really goes to the point that it’s not really just about emerging markets, you know even in a developed country we’re faced with many social issues that we’re still trying to solve and I think shared value is a great framework that government can use to help really consider what those outcomes and opportunities might be. How do you find time for yourself amongst your busy schedule and what do you like to do in your spare time? I do set some boundaries and I’m becoming better about it as the years go by. Time with my family is still fundamentally important and [also] I’m a keen runner. So running for me has become a real outlet and just being able to escape down to the Mornington Peninsula and get out of the city. I’m a country girl so getting out of the city is a valuable way for me to renew my energy. You’ve got to have boundaries and that’s sometimes hard to do when you’re running these little organisations. Because with the advent of these fantastic smartphones you can always be communicated with. And so sometimes you just have to set some boundaries and turn the phone off over the weekend if you can. Do you have any favourite sayings or inspirational people that guide the work that you do? Well for us it’s really about changing the paradigm around capitalism and really harnessing capitalism for good. And Michael Porter – who along with Mark Kramer were the original authors of the work around shared value – really continues to inspire me and I guess one of the things that I consider a lot is a quote that he often uses about the ineffectiveness of philanthropy – that philanthropy is decades behind business in applying rigorous thinking to the use of money. And I think that businesses are so much better placed to be able to do that even though we don’t want to bag philanthropy, as it’s so incredibly important still. But it’s that kind of philosophy that drives me and it’s really about realising the potential of capitalism in helping to solve the world’s social issues. And if you’re trying to harness that, that’s kind of what drives me and a lot of the work that Porter has done contributes to that.